November 8, 1858 – Item in the Chicago Press and Tribune for this date: “Ald. Wahl, of a special committee, reported in favor of measures looking to the abandonment of the present cemetery for burial purposes, and the selection of another site at a distance from the city limits. An order was passed instructing the Mayor to appoint a committee to report upon the subject at an early day.” [Chicago Press and Tribune, November 8, 1858] So this is a start … the wheels of time turn slowly. 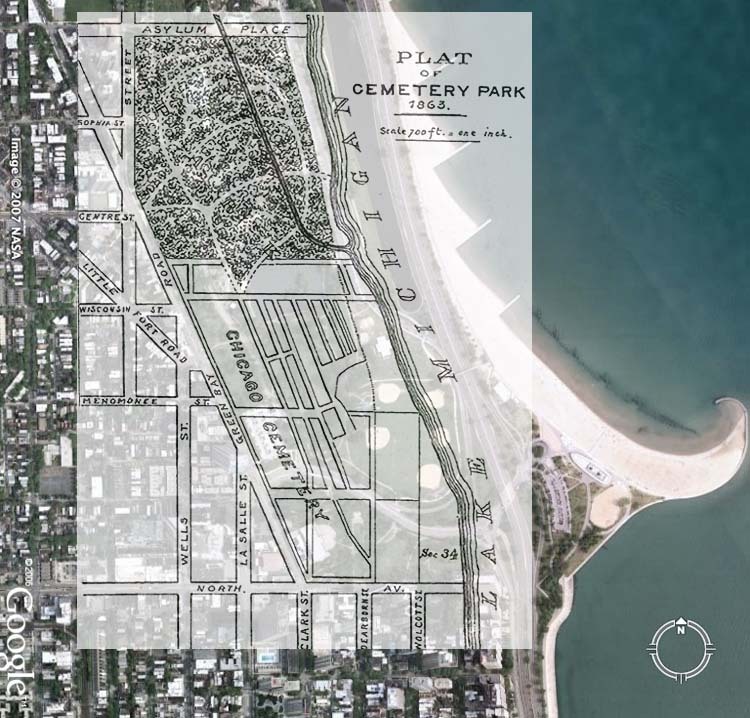 Six years after this two-sentence beginning, an ordinance is published that ends burials in Lincoln Park with the exception of burials in plots that have already been purchased. It isn’t until 1869 that the city council passes jurisdiction over the Lincoln Park cemetery grounds to the Lincoln Park district commissioners. At that point, although the exact dates are unclear, thousands of bodies are disinterred from the old cemetery and moved to other locations. As this project begins there are 25,000 bodies interred in the Potter’s graveyard alone. Not every grave was found … as recently as 1998 when the Chicago History Museum dug up part of the area for a new parking facility, the remains of 81 individuals were discovered. The map of the old cemetery is superimposed on the modern city in the above photo. November 8, 1922 – Chicago Cubs President William Veeck announces that the team will completely renovate its north side ballpark in order to increase its size to accommodate 32,000 fans. The work will make it the largest baseball venue in the country. Zachary Taylor Davis, the architect who designed the original park as well as Comiskey Park on the south side, has drawn the plans for the upgraded field with work to begin immediately. At a cost of $300,000 bleacher sections will be added to right and left fields. According to the Chicago Daily Tribune the plan will be as follows, “The present stand will be cut into three parts . . . the right and left field wings will be separated from the part which circles behind the home plate. The circular piece will be moved about sixty feet toward the intersection of Clark and Addison streets. The right field wing will remain in the same spot, while the left field wing will be rolled back and out so that the further end touches Waveland Avenue. Then the two gaps will be built in.” The field will be lowered three feet, allowing several rows of boxes to be added in front of the previous set of boxes. The renovation does not include the addition of an upper tier. The distance from home plate to the front of the seats in right and left fields will be 354 feet. It will be six years short of a century before the park welcomes a victorious World Series team. The grainy photo above shows the process of expansion in the winter of 1922.